Series 9 ‹ Flog It! Browse content similar to Series 9. Check below for episodes and series from the same categories and more! The team find a set of hand-written playing cards and a bronze statue in Malvern. Adam Partridge gets in a spin over a wooden top in Malvern. Paul Martin and the team are in Warminster, and Paul visits the American Museum near Bath. Paul Martin is joined by experts Kate Bateman and Adam Partridge in Malvern. Paul Martin is joined by experts Kate Bliss and David Fletcher in Wiltshire. Paul Martin is joined by experts David Barby and David Fletcher at Truro Cathedral. Presenter Paul Martin is joined by experts Mark Stacey and David Fletcher in Dorset. Paul Martin is joined by experts Will Axon and Elizabeth Talbot in Clacton-on-Sea. Paul Martin is joined by experts Charlie Ross and Elizabeth Talbot at Ely Cathedral. Interesting finds in Oxford include a stylish Rolex watch and an unwanted inkwell. Paul Martin and experts Kate Bateman and Adam Partridge visit the spa town of Malvern. Paul Martin is joined by experts Mark Stacey and Adam Partridge in Bangor in north Wales. Paul Martin is joined by experts Thomas Plant and Michael Baggott in the Cotswolds. Paul Martin is joined by antique experts Mark Stacey and David Fletcher in Dorchester. Mark Stacey finds a silver purse and Adam Partridge values a French violin in north Wales. A Delftware plate causes quite a stir in the auction room. Paul Martin and Charlie Ross get very enthusiastic about an arts and crafts ale jug. Paul is in Truro, and learns about one of the worst mining disasters in Cornish history. The experts uncover some prehistoric axe heads and Parisian opera glasses. The team values some gold watches and rings, and an unusual cavalry officer's sword. Kate hopes she's struck gold with some coins that could be worth thousands of pounds. Paul Martin is joined by antique experts Tracy Martin and Charlie Ross in Oxford. Items up for valuation include a collection of thimbles and an antique sextant. Paul Martin and antique experts Will Axon and Catherine Southon visit Lissanoure Castle. A gold watch with a mysterious history excites at the Council House in Bristol. Paul Martin and experts Mark Stacey and David Fletcher visit Dorchester. The crowds flock to a valuation day in Cirencester. Presented by Paul Martin. Paul Martin and experts Will Axon and Michael Baggott visit Ashbourne in Derbyshire. Paul Martin explores the entertaining and decorative world of magic lanterns. Among the items brought along is a journal with links to HMS Beagle. The items valued in this programme include a boxed collection of toys and a mirror. The team look for collectables at the Queen Elizabeth Grammar School in Derbyshire. James Lewis finds a gold pocket watch and Adam Partridge looks at a collection of pipes. Finds include a Chinese snuff bottle and a miniature grandfather clock. A couple of Moorcroft pieces get expert Catherine Southon excited. Among the items uncovered in Herne Bay is a fascinating set of flicker books. Items include a mystery marquetry box and a rather special painting. Items include a 1938 autographed cricket bat and an unusual Clarice Cliff plate. Paul Martin explores the charms of Heckington's eight sail windmill in rural Lincolnshire. Paul Martin visits a wonderful architectural gem - Portmerion. Finds include an early Barbie doll and a fantastic diamond brooch. Paul takes time out to investigate 'the Warminster Thing'. Paul Martin and antiques experts Will Axon and Catherine Southon visit Lissanoure Castle. Items include a Georgian silver wine funnel and a 1920s McVitie's biscuit barrel. Experts James Lewis and Adam Partridge value an exquisite tea pot. Presenter Paul Martin is in Ashbourne. A picnic set brings surprising auction results. A tea caddy and a microscope are among the items valued in Bangor. Gems include a Japanese ivory panel and a pristine 1950s train set. The finds include 16th century plates and handbags from the 1960s. The team find various items in Todmorden Town Hall and Paul Martin visits Gawthorpe Hall. Paul Martin explores the history of one of the finds: a carved Chinese libation cup. David Fletcher has a heated discussion about a tiny pottery mouse. Paul Martin and experts David Barby and David Fletcher visit Truro Cathedral. Items include a racing pigeon timer and some African artefacts. Michael Baggott meets a solemn-looking Chinese figure. Among the treasures are a pair of bronze vases and a Moorcroft cruet set. Adam Partridge spots a bit of local history made from cast iron. Paul Martin and experts Will Axon and Michael Baggot value items in Derbyshire. Paul Martin, David Fletcher and Michael Baggott are at the end of the pier in Worthing. Paul Martin is joined by experts Catherine Southon and Adam Partridge in Yorkshire. 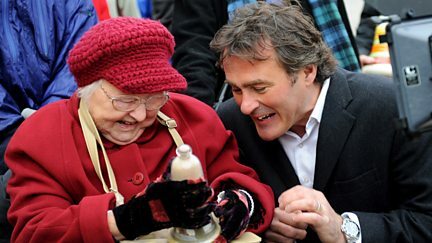 Paul Martin, Anita Manning and James Lewis pay a visit to Balbirnie House in Fife. Paul Martin, Kate Bateman and Mark Stacey are on the Kent coast at Herne Bay. Paul Martin is joined by Catherine Southon and Adam Partridge at Todmorden Town Hall. Paul Martin, Kate Bateman and Mark Stacey are at Balbirnie House in Fife. Paul Martin is joined by experts Anita Manning and Thomas Plant at Warwick Castle. Paul Martin is joined by experts David Fletcher and Michael Baggott in Worthing.